Herons Nest: A cozy lake cottage, with a huge patio for large family events, is located on Magician Lake in Sister Lakes, Michigan. The property is located at the mouth of Polk Channel, a mile-long waterway excavated in the 1950's, running from Magician Lake through Viewpoint Beach...surrounded by pines and hardwoods that have been growing for a century or more. 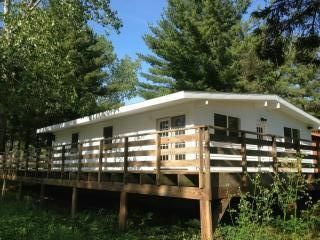 The cottage is perfect for a family vacation, or couples trying to get away from the hustle and bustle of everyday life. Fish from the dock and swim and boat on the lake. A sandy swimming and boating area is close by. Air conditioned. Boat rentals, which include kayaks, canoes, paddle boards and pontoon boats, are available for daily or weekly rates.. Enjoy the BB - Q and an evening around the fire pit. provided by Viewpoint Beach management. The cottage is heated; you will be warm and cozy on a cold night after busy, fun fall days in the country. Three-night minimum. Sleeps 8. We have three cottages next door to each other...Frog Hollow, Turtle Cove and Herons Nest...perfect for a fall group retreat, a reunion or a get-a-way with a group of friends. Celebrate your wedding in a natural setting. The nearby small town, Dowagiac, MI, offers a collection of boutiques, restaurants and Caruso's Candy Kitchen and Fountain which opened it's doors in 1922. Herons Nest, one of three adjacent cottages, is situated on a waterway that provides a variety of wildlife...frogs,, turtles, a blue heron family and our Magician Lake Eagles. Nearby Sister Lakes has the local grocery store, Driftwood Ice Cream Shoppe to local breweries and great restaurants. Lake view visible from back porch. Herons Nest is located on Polk Channel. A boat dock is available for your own craft or a rental boat. Herons Nest is located on the Polk Channel, which was dug in the 1950's, and provides boating excursions for all watercraft. The Channel open to Magician Lake at both ends. Extensive parking available for events. The living room is extended outside onto a large patio with picnic table, lounge chairs and conversational groupings of furniture. Inside table and kitchen bar; large picnic table on patio; small picnic table on lawn. The lawn is large and is great for family gatherings. Kayak/Canoe/Paddle Board rentals available after check-in. Check with owner about availability. Pontoon boat rentals available after check-in. Check with owner for availability. Extensive deck with large picnic table and lounge chairs. Very clean and being on the channel was so peaceful. We had a wonderful stay. It was very peaceful there. The channel was really pretty to ride our boat through. We caught fish on the lake. The house was clean. We were supplied wood for the fire pit. Our family always has a great time when we stay here. Its very clean and the fishing is great. Thank you for your kind words! Your husband caught a lot of fish!!! We had a wonderful time! Will come again! Cynthia was very helpful and around if you needed her. The house was perfect for our group! I am always delighted when our guests have a memorable time with us. We always enjoy the Heron’s Nest. It is ideal for a large outdoor event. Heron’s Nest is peaceful and nice. Located on the manmade canal of Magician Lake. The cottage is cozy, well appointed and functional. The only major downside is that there is no washer and dryer. Ms. Cynthia is the ideal hostess, she is close but never infringes. We look forward to vacationing at the Herons each year. We strive to make your vacation enjoyable! My family stayed in the Heron's Nest earlier this month. The cabin was well maintained and very clean. There was plenty of room for everyone. The area was very nice. The cabin rests right on the channel. My kids enjoyed fishing off the dock and caught a steady supply of small bluegill and sunfish. This was a great learning experience and taught them how to feel the bites and watch their bobber. The pontoon boat was nice and well maintained as well. The fishing in Magician Lake was good. We caught fish every time out. We even caught a 30 inch walleye. We are planning to return next year. I'm so pleased that you enjoyed your stay. We enjoyed having you with us! My 2 grandchildren, my sister, a friend and I stayed at the Heron's Nest for 9 glorious days, July 14th through the 23rd of 2017. Yes, Glorious! The house is well appointed, spacious and beautiful but for me, the three-sided deck was the star! The Heron's Nest and the adjoining vacant lot space were ideal for a large family gathering. The pontoon and paddle board rentals added an another dimension of fun for all. Cynthia and Franz were the ideal hosts, friendly, & helpful without hovering. The property affords plenty of space for pitching tents, but be sure to clear it with the owners in advance. There is direct access to the canal for fishing and docking but you'll have to walk a short distance to swim. I have rented vacation homes before but the Heron's Nest is now my favorite. I hope they'll have us back next year and maybe we'll get both The Heron's Nest and one of the adjoining properties, Frog Hollow or Turtle Cove. Thank you for your kind words! We strive to make each guest feel welcome. Swimming, watersports, fishing, sunbathing, barbequing, nature trails and family activities, to name a few. Jet skis and speed boats can be rented from Lake Effect Powersports or JD's Marine. Campfire stories around the firepit are definitely recommended. The Sister Lakes area has an ice cream parlor, a roller rink and a multitude of restaurants to enjoy. Downtown Dowagiac features a number of boutique shops, the Beckwith Theatre, the Wood Fire Italian Restaurant, and Caruso's, a candy shoppe and soda fountain that has been in business since 1922. "We would love to have you stay with us! Check-In: 3:00 p.m. (EST) Check-Out: 11: a.m (EST) Rate Details (In US Dollars) Firewood: 2 bundles FREE at check-in. Boat Rentals Available: Pontoon boats, kayaks, canoes, paddle boards. Request fee schedule. Bed pillows are provided. Bed linens, towels, paper goods and charcoal for the BB-Q are NOT provided. Mattress sizes are: 1 queen; 7 twin. At check-out it is expected that the cottage will be left broom clean condition with no visible damage. If additional cleaning is required, funds will be deducted from the security deposit.